Homemade Monkey Bread is so much easier than you think! This from-scratch version of a cinnamon pull-apart is the perfect brunch recipe! 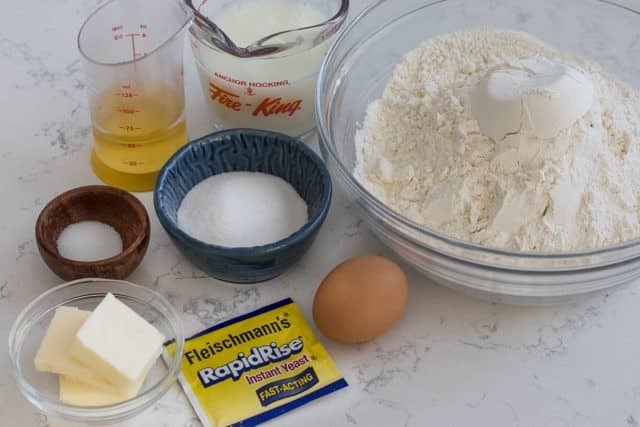 This post has been sponsored by Fleischmann’s® Yeast and Homemade Monkey Bread is the easiest yeasted recipe you’ll ever make! I learned too late as a parent that if you do something for a holiday, it becomes a tradition. Take the Elf on the Shelf: if he brings a typed note from Santa when he arrives…he most certainly will be expected to bring it again. Or if the leprechauns mess up the house when your daughter is 4, she will expect them to do it again and again…and again. So…I always make monkey bread for Christmas. It’s not worth the fight; one year I really wanted cinnamon rolls so I made both…because it was required. 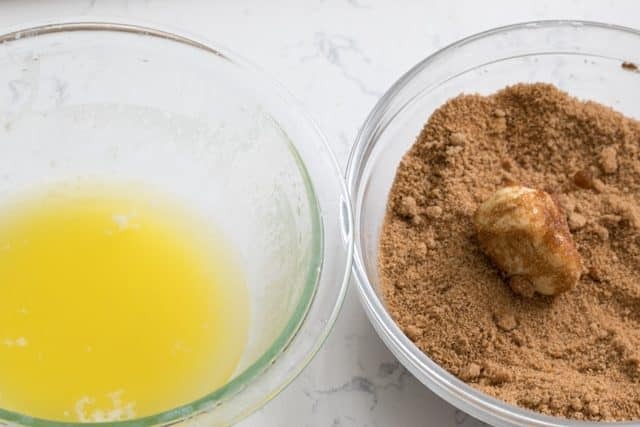 In the past I’ve always made monkey bread the “easy” way, with those canned biscuits, but no more: from now on I will be making this Homemade Monkey Bread! I absolutely love the flavor of the from-scratch dough. It’s also lighter and airier than the store-bought kind. And – it’s way easier to make from scratch than I thought it would be. Working with yeast is not scary, I promise!! Some of you may be wondering why my monkey bread is in a 9×13-inch baking dish and not the normal fluted pan. It’s intentional: I’ve found that making monkey bread without a Bundt pan cooks faster and more evenly. I’m pretty much a pull-apart bread aficionado now after so many years of making it. While it looks gorgeous when you bake it in a Bundt pan, it takes forever to cook and I find that the top gets overdone while the inside stays raw. 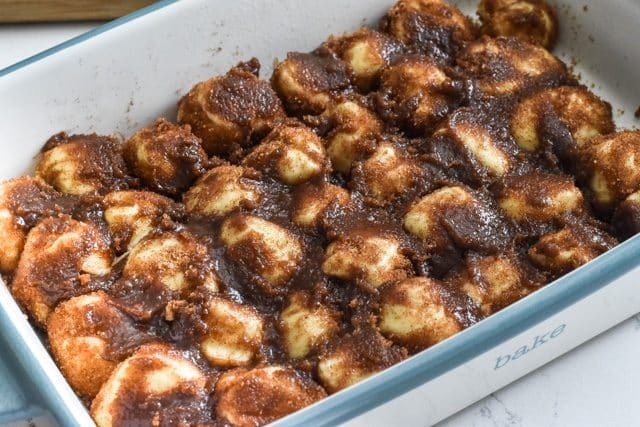 Baking monkey bread in a casserole dish makes it cook more evenly and faster! To make homemade monkey bread, you need to use yeast. 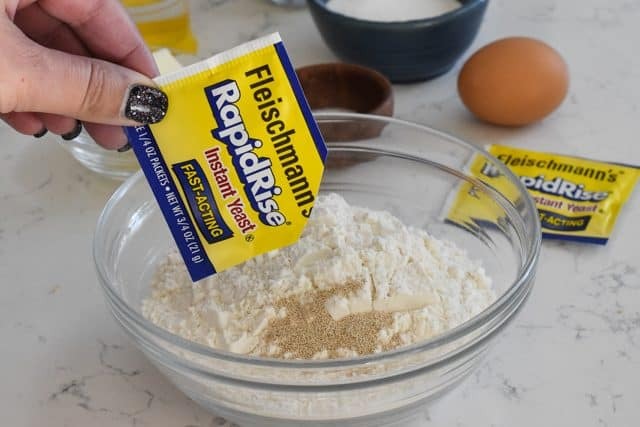 I’m showing you how I make this recipe using Fleischmann’s® RapidRise® Yeast. It’s a fast-acting yeast that makes baking from scratch much easier and faster than if you used active dry yeast. So, how do you make a simple monkey bread? Those simple ingredients mix to form a sweet yeasted dough. The dough is hearty enough to easily knead and work with, but it tastes light and delicate. When you use other kinds of yeast (like Active Dry), you have to add the yeast to hot water with sugar and let it sit until it bubbles. 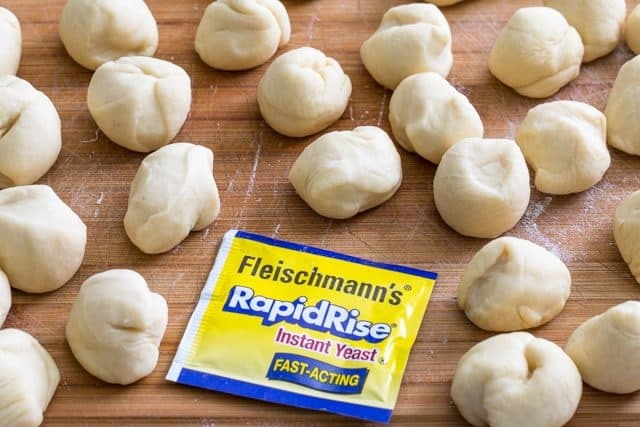 The thing I love about using Fleischmann’s® RapidRise® Yeast is that you don’t have to proof it. This takes the guesswork out of working with yeast as well as shaves off some time. 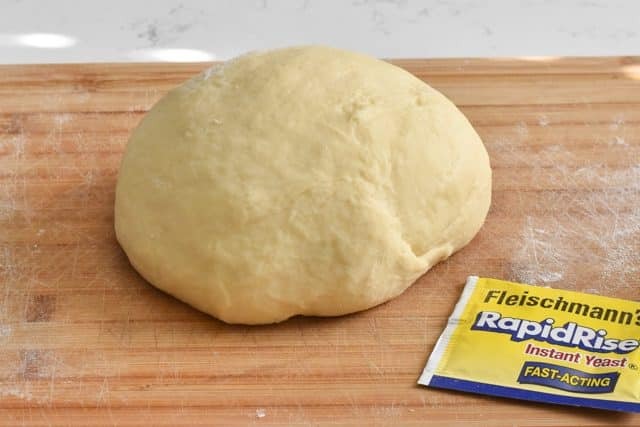 You simply add your Fleischmann’s® RapidRise® Yeast in with your dry ingredients (flour, sugar, yeast, and salt). Then, in another bowl or measuring cup, you add your wet ingredients. Milk, water, and butter get added to the measuring cup. You can use any kind of milk (regular, low-fat, or non-fat). I added slices of butter instead of a chunk, so it would melt easier. Once you have your wet ingredients in a microwave-safe dish, simply heat it until it’s about 120-130°F. This will wake up the yeast once it’s added to the dry ingredients. 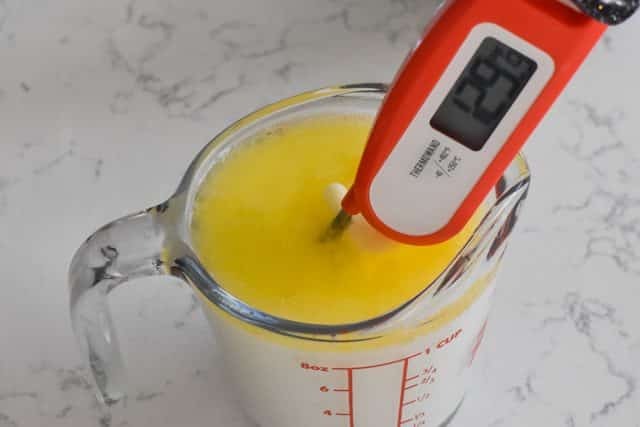 I recommend an instant read thermometer for working with yeast. It really does take the guesswork out of it, but if you don’t have one just think hot bathwater when testing temperature. 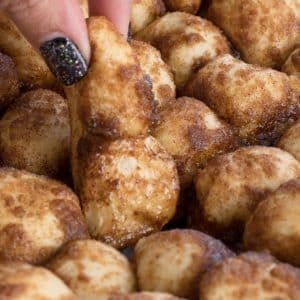 This homemade monkey bread recipe is written to be made with an electric mixer fitted with the dough hook. I absolutely love my dough hook; it takes time off of having to knead my dough. If you don’t have an electric mixer, you can do this with a hand mixer or by-hand, it’ll just take longer to come together to form a ball. Once the dough is mixed (it should be soft to the touch but not have much transfer to your hands when touched), turn it out onto a floured surface and knead it until it forms a ball that springs back at you. 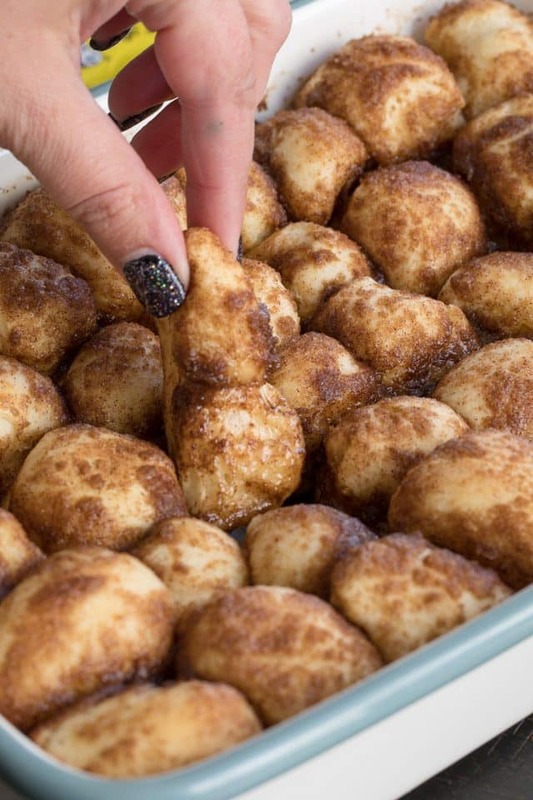 Now it’s time to form your monkey bread. 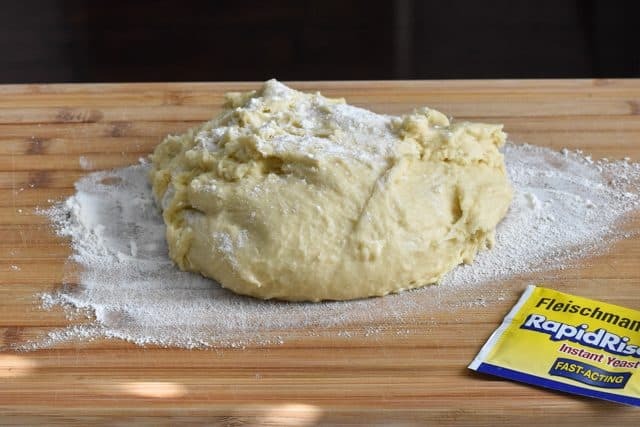 If you simply rolled out this dough, you could make cinnamon rolls, but we’re going to portion the dough into 36 small balls of dough. 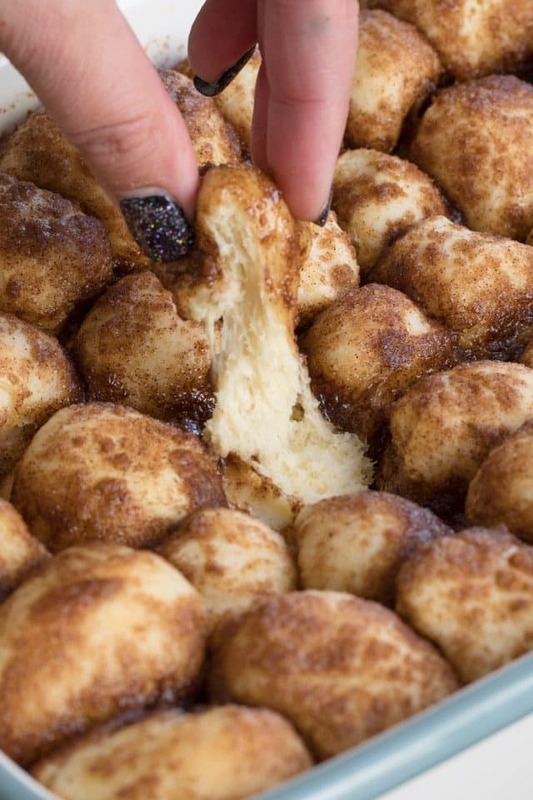 Once you have 36 pieces of dough, it’s time to make the filling and assemble this from scratch monkey bread. Simply melt butter in one bowl and mix brown sugar and cinnamon in another. Dip the pieces into the butter then roll in the cinnamon sugar and place in your pan. After you’re done dunking and rolling, you’ll have some sugar and butter left over. Mix them together and pour over the monkey bread in the pan. Once they’ve risen, just bake for about 20 minutes and then serve. They pull apart easily and are sweet and fluffy. We could NOT stop eating them! Homemade Monkey Bread is much easier than you think and perfect for brunch or even dessert! Working with yeast is so easy; once you start you’ll want to make all the yeasted recipes! Use Fleischmann’s® RapidRise® Yeast and let me know what you make by tagging me on social using #crazyforcrust! Trilogy Cinnamon Rolls – the best ever! Recipe slightly adapted from this one on the Fleischmann’s website. 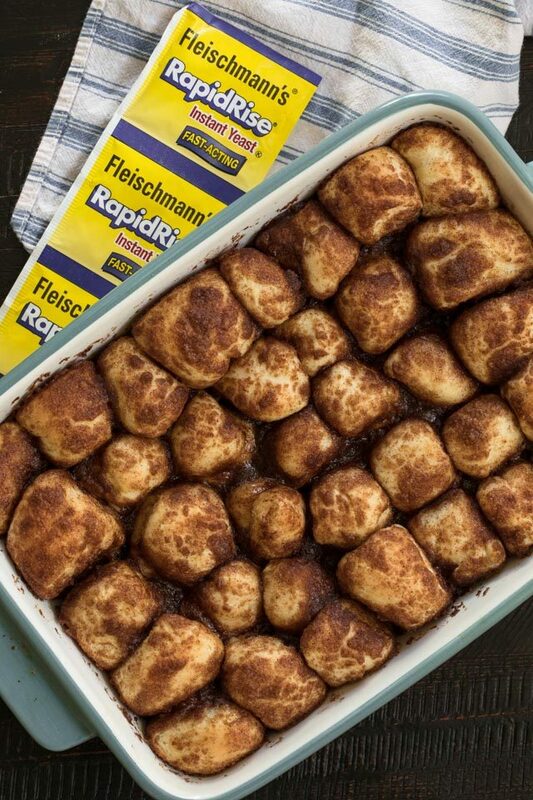 Homemade Monkey Bread is so much easier than you think! This from scratch version of a cinnamon pull-apart is the perfect brunch recipe! It’s best to use a stand mixer fitted with a dough hook. You can also do this by hand or with an electric mixer, but it will take longer. Combine 2 cups flour, sugar, dry yeast and salt in a large mixer bowl and whisk until blended. Combine milk, water and butter in a microwave-safe bowl or measuring cup. Microwave on HIGH in 15 second increments until very warm but not hot to the touch, about a minute (120° to 130°F; butter won’t melt completely). Add to flour mixture with egg. Beat 2 minutes at medium speed, scraping bowl occasionally. Add another 1 cup flour; beat 2 minutes at high speed, scraping bowl occasionally. Stir in just enough remaining flour so that the dough will form into a ball. Combine brown sugar and cinnamon in a small bowl. Place melted butter in another small bowl. Cut dough into 36 pieces (cut in half, cut each half in thirds and each third into thirds again, then each third in halves). Dip each piece into the melted butter and then roll in the cinnamon sugar mixture. Spray pan with cooking spray. Place dough into pan. Combine remaining butter and sugar and drizzle over rolls. Cover with towel; let rise in warm place until doubled in size, about 45 minutes. 9x13-inch baking dish: place dough pieces into single layer. After rising, bake for about 20 minutes or until golden and cooked through. Fluted tube pan or Bundt pan: bake for about 30 minutes, or until golden and cooked through. Two 9x5-inch bread pans: bake for about 20 minutes, or until golden and cooked through. 12 monkey bread muffins: place 3 pieces in each greased muffin cup. Bake for about 20 minutes, or until golden and cooked through. If you plan to remove from the pan for serving, cool 5 minutes in pan then invert onto serving plate. If using unsalted butter, add 1/4 teaspoon salt to the filling. 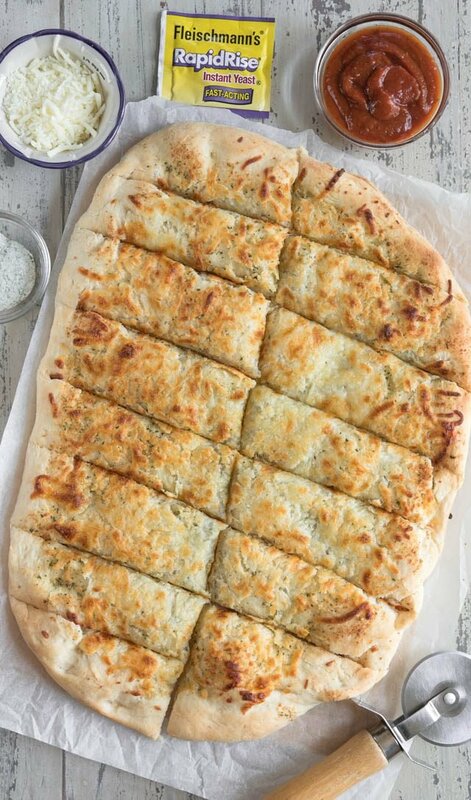 Cheesy Ranch Breadsticks also made with Fleischmann’s RapidRise Yeast! 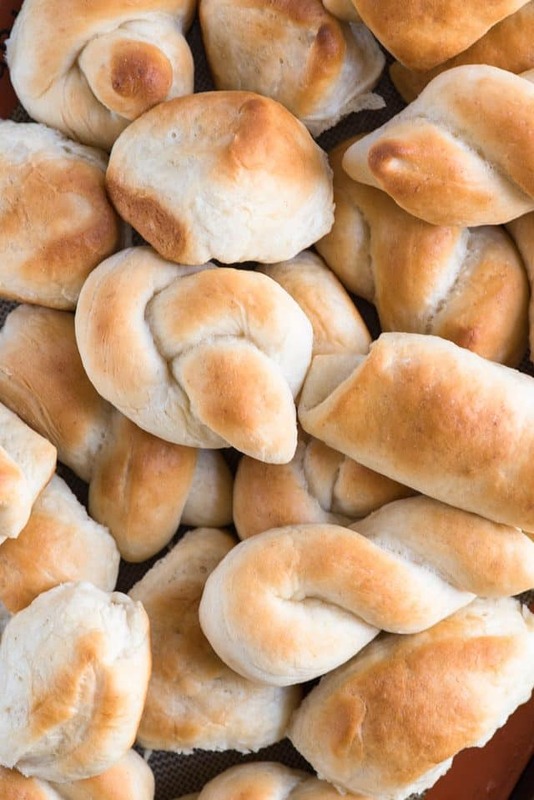 I could live on these Buttery Homemade Rolls! Hi! Did you try making it the night before? Did it work? Thanks!